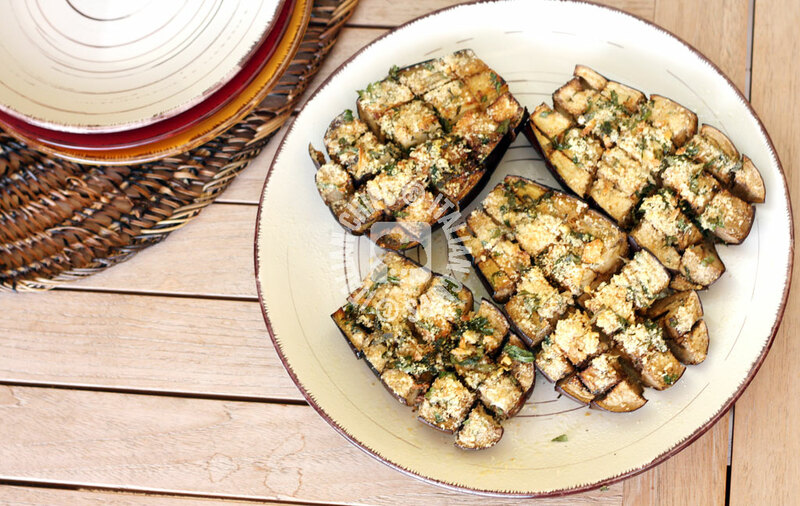 Another baked eggplant recipe? Yes! If you are like me, who prefers to cook seasonal products, we have to look for different recipes for cooking eggplants, zucchini and tomato quite everyday ;-D.
My husbands literally hates peppers (the other Summer vegetable), so I have to choose among tomato, zucchini and eggplants and so I am always trying new recipes, otherwise it becomes a boring meal. I have to admit that I have found (already, because the research never ends) a lot of tasty recipes for these Summer specialties. 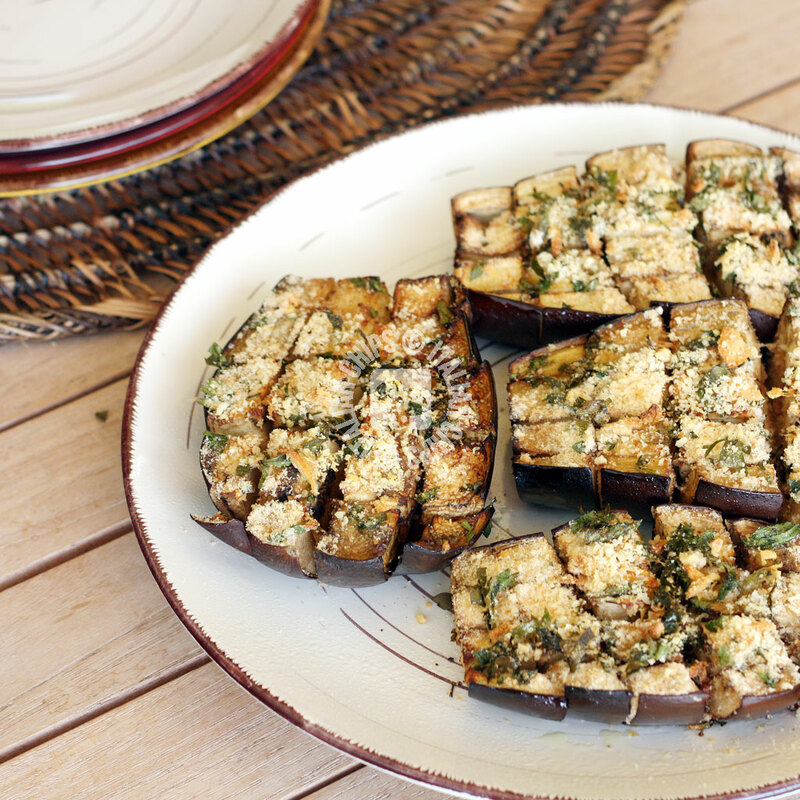 Have you already tried the eggplant gratin (one of my favorites)? Or the eggplant parmesan with no frying? Or the (always frying free) stuffed ones? This new baked eggplant recipe attracted me because it is simple (during these extremely hot days here in Italy we feel like not cooking – not doing anything – at all) and it is a healthy recipe as it is baked and contains little fat. 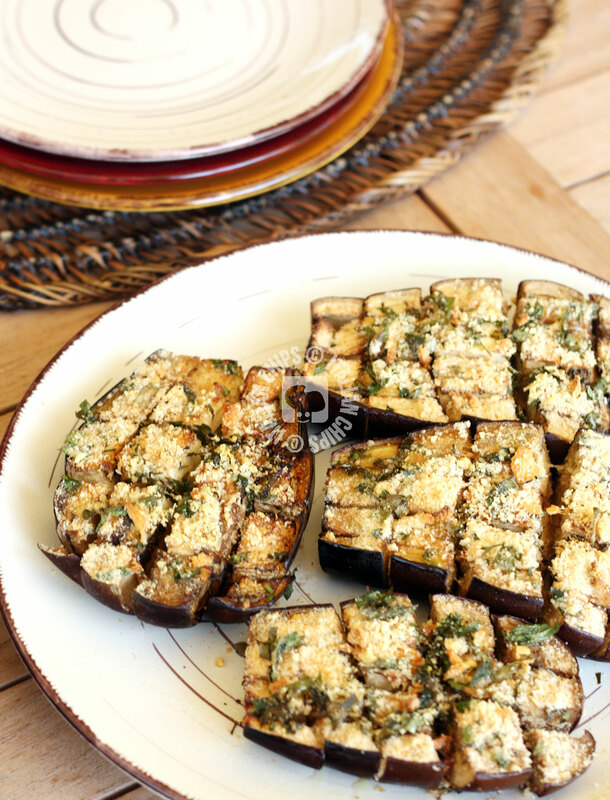 I used to prepare baked ones but I used to make just a couple of cuts inside the half eggplant – in this recipe, you also cut part of its peel, and it helps cooking it inside in less time. I found this recipe on the Italian blog Allacciate il Grembiule. I prepared them also last Saturday for lunch. 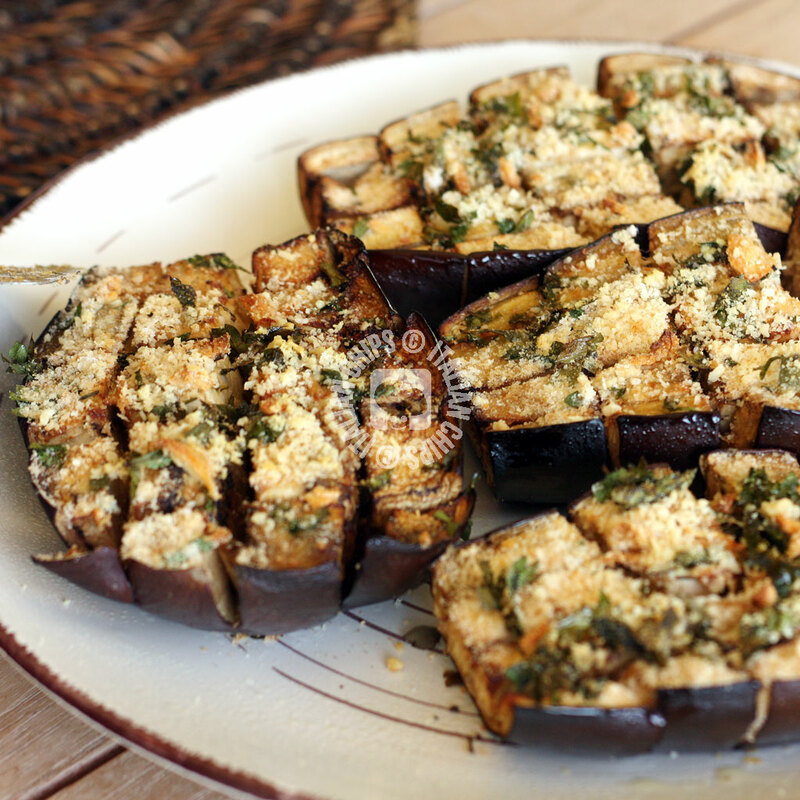 I prepared them in advance and, as it was a very hot day, I served them at room temperature – and there were no leftovers ;-D.
For this recipe I prefer the black quality of eggplant instead of the purple ones. Turn on the oven 180°C/356°F. Wash the eggplants and cut the leaves. With a sharp knife make deep cuts forming like a chessboard. Do not reach the bottom (cut about ⅔ deep). Wash and mince the parsley. Take some parsley and insere it inside the cuts. Put the eggplant halves on a baking tray covered with parchment paper. Add the garlic spreading it using your fingers so that some will go into the cuts. Add breadcrumbs and grated cheese, if desired. Add a generous thread of extra virgin olive oil. 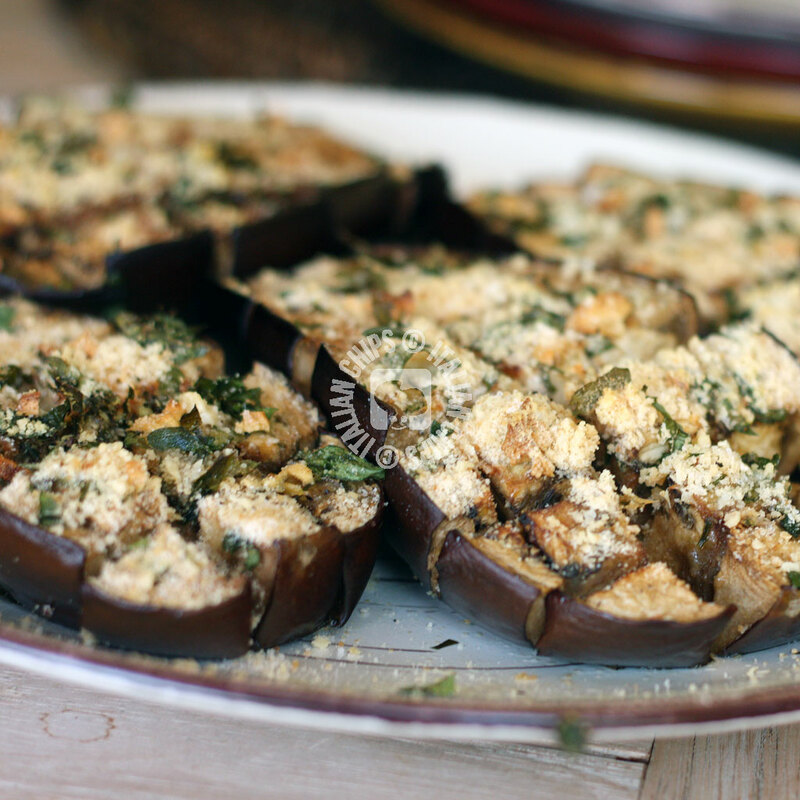 Bake them for about 30 minutes, or until soft (it will depend on the size of the eggplants).